The St. Louis Chordinals is the chorus for you! We have openings for all voice parts. No audition is required. You will be provided with all your music and CD tracks, and your first month of dues are free! Come to one of our rehearsals and just listen, or participate as we learn new songs and practice ones we already know. You will find that singing has many benefits including better health, relaxation and peace of mind. You may attend four rehearsals before you decide to join our chorus. The St. Louis Chordinals is the only Harmony, Inc. chorus in the St. Louis area. Harmony, Inc. is our parent organization, dedicated to preserving the unique American art form of Barbershop harmony. For more information, see the link to their website on our Links page. "I came to sing with the St. Louis Chordinals 16 years ago and never left. The singing experiences, learning opportunities, genuine fun and cherished friendships keep me coming every Tuesday." 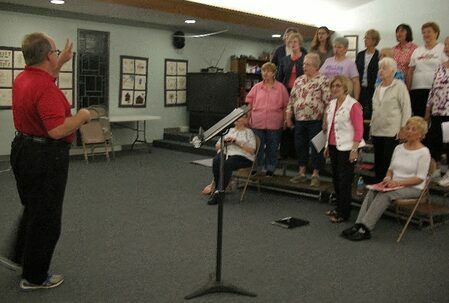 "Singing with the St. Louis Chordinals is energizing and uplifting. I have learned so much about a cappella singing and I think of all these ladies as my 'sorority sisters.'" We welcome visitors at our practices on Tuesday evenings. Visit our Rehearsals page for more information.